It is fall here in Kentucky, but that isn't stopping me from wearing comfortable and fashionable sandals for the season. With Juil Sandals you can be connected to nature. What are those circles on the toes and heals? 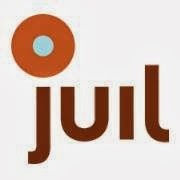 "Juil footwear cleanses your body of free radicals, based on a concept known as earthing or grounding. Whereas most footwear insulates your body from making a connection with the earth, the copper "dots" in Juil earthing shoes act as a conduit between your body and the Earth, allowing you to stay truly connected and balanced." And whether you side with those thoughts or not, they are very great sandals! They felt a little tight when they first arrived, so take note that you will have to wear them in a bit to get the true comfort from them. The upper leather will stretch and conform to your foot. This particular style Mesa Slide was designed for higher arches and I could feel the difference with that. This style is bit narrow, and suggested for narrow to medium feet width. The shoes mold to your feet for comfort and longevity in wear, with built in support that mimics barefoot walking. I love that these can easily be worn in a casual or dressy occasion. Juil has several styles of shoes for both woman and men. Check out their big sale now as they make room for new styles coming up. I absolutely loved the deep orange/rust color of these shoes, they spoke Fall for sure.